California was one of the states hardest hit by a national recession in the early 1990s. A decline in defense spending that seriously hurt the state’s booming defense industry, plus sharply reduced demand for goods and services produced in the state led to a collapse of the real estate market. Though the city was only five years old when the recession began in 1989, “Few communities emerged from the recession stronger, or with better prospects, than West Hollywood,” according to Los Angeles economist Joel Kotkin. He wrote an opinion piece published by the Los Angeles Times on Feb. 26, 1995 in which he credited the “gay economy” for West Hollywood’s economic resilience. 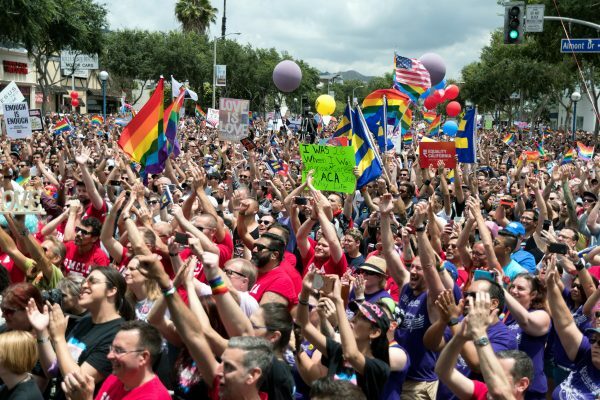 The headline, “L.A.’s Latest Economic Force: Gays, Lesbians” was the first such acknowledgement of the significance of the city’s gay economy in the mainstream news media. “Its key commercial districts – the Sunset Strip, Santa Monica Boulevard and the Pacific Design Center – are thriving. For example, the once-troubled Design Center and the city’s entertainment-related offices have occupancy rates around 85%, far higher than most surrounding cities. Even the number of restaurant openings has increased at a time when closures are the rule,” Kotkin said. “West Hollywood’s economic success, most insiders agree, directly stems from its large concentration of gays and lesbians, who represent about one-third of its population. In many ways, they anchor the city’s economic growth much as the Chinese do in the San Gabriel Valley or the Jews in the Pico-Robertson district of Los Angeles,” the op-ed states. At the time, Kotkin was Senior Fellow, Center for the New West at Pepperdine University. Following California’s 1990s recession – which U.S. News and World Report called one of the four nastiest in the country – gays offered a badly needed stimulus to an economy that had been damaged by the defection of mainstream corporations and more conventional middle-class citizens. The concentration of gay community also plays a role in developing industries – entertainment, fashion, music and design – all of which are drivers of West Hollywood’s economy. Cities should cultivate high-wage, knowledge-value industries like these that demand the skillful interaction of creative, artistic and technological expertise that have a large population of creative and entrepreneurial people often found in the gay community. With gays and lesbians concentrated in a small area, the gay economy took on three distinctive components, Kotkin says. First, they revived neighborhoods once regarded as in decline and then opened shops that offered clothing they were interested in, as well as bookstores and restaurants. A prominent example was Out magazine, which was based in New York City and had offices in L.A. The associate publisher created a company, Don’t Panic, that sold T-shirts and other apparel from its store at the corner of Santa Monica and San Vicente boulevards for many years. Second, by becoming a magnet for gay consumers, West Hollywood drew valuable business, both gay and straight. Many visitors to West Hollywood come from the immediate area, often from larger, dispersed gay populations, on weekends and holidays. Abbe Land, a City Council member at the time, credited those visitors for helping her city continue its rapid expansion as a tourist attraction. “Between 1991-93, not exactly a high point for Southern California’s visitor industry, West Hollywood’s hotel revenues grew by a remarkable 205%,” according to Kotkin. Third, members of the gay community have a high propensity to buy from each other, a remarkable characteristic. Kotkin cites “an explosion of gay-oriented guidebooks and directories that channel information from gay-oriented companies to gay consumers.” Gay spending power is a big part of this, given the discretionary income gays and lesbians have to spend on fashion, entertainment and tourism, Kotkin notes. Thanks again Mr Bob Bishop for this story and thanks to Henry (Hank) for the oversight of the excellent submissions to WehoVille, a much needed publication. Gays represent 1/3 of the West Hollywood population? Since when does 41% translate into 1/3?